Sometimes one sees a great film, but it doesn’t seem so at first. Sometimes it has to rattle around in your head for a while before you realize that what you have just seen is a seminal work of art. Such is the case with the films of Jacques Rivette I have seen, particularly Le Pont du Nord (“North Bridge”). In that film, we have two main characters, played by the mother/daughter team of Bulle and Pascale Ogier. Bulle (Marie Lafée) has just been released from prison and is too wracked with claustrophobia to enter a building or a car without freaking out. Pascale (called by the boy’s name of Baptiste) runs across Bulle three times, making her conclude that they are destined to be together. Pascale is the ultimate paranoiac, mutilating the eyes of models and actors shown on large posters. Bulle hooks up with her old boyfriend Julien, who seems to be on some strange quest. 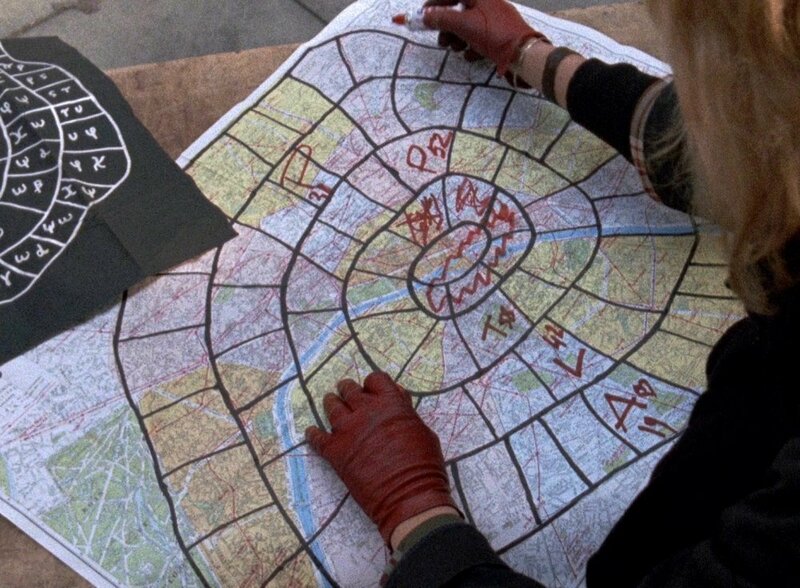 Pascale pulls a switch on his portfolio, allowing her and Bulle to see its contents, which consists mostly of newspaper clippings and a map of Paris (above) which acts as a kind of game board. Bulle and Pascal decide to follow it, noticing that it seems to be a version of the European Game of the Goose, similar to the English Snakes and Ladders and the American Chutes and Ladders. Bulle and Julien meet with death at the square containing the Pont du Nord, but Pascale ends up getting a martial arts lesson from “Max,” one of the mysterious characters who is also playing the game. I was strongly impressed by Pascale Ogier as the paranoid gamine. Three years later, she was to die at the age of twenty-five of a heart attack aggravated by her use of recreational drugs. She is one of those actresses whose eyes are expressive and who use their glances to attract the viewer’s attention (and, admit it, admiration). I was appalled to find, when checking out her career, that her life was cut so short. Jacques Rivette is one of the lesser-known directors of the French New Wave. I have seen in all three of his films, set at the beginning—Paris Belongs to Us (1961)—the middle—the film we are discussing—and the end—La Belle Noiseuse (1991)—of his career. All of his films left me hungering for more. This entry was posted in film and tagged bulle-ogier, jacques-rivette, le-pont-du-nord, pascale-ogier. Bookmark the permalink.